Wooden garden gates in a choice of timbers — built to last! 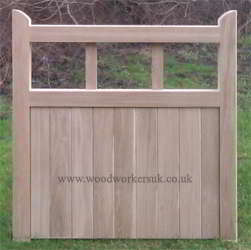 All garden gates shown below are available made to measure in a choice of Scandinavian Redwood (Softwood), Accoya (Modified Softwood), Meranti, Idigbo and European Oak (Hardwoods). All garden gates are generally manufactured in heights of up to approx 4ft 6 (1370mm) high, for gates taller than this (but again made to measure) please see our pedestrian gate pages for more options. 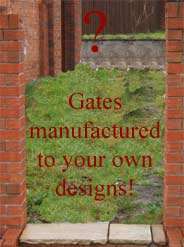 Want to get a costing of any of our garden gates? Then please either email/phone/fax or call into our workshops for a full personalised costing of any of our gates or use the contact form at the bottom of the page. As well as every garden gate you’ll see on our website being made to measure, all our gates can also be customised to your own requirements (i.e. if you need additional rails adding for example). 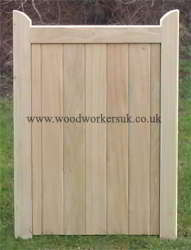 For more information please see ‘customise your wooden gates’ page. 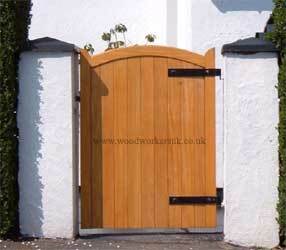 Our Curved headed garden gate, shown in Idigbo (with a light oak stain). The Curved garden gates feature a full thickness solid head (we don’t just shape the boards with a curve!) with a 3″/75mm rise. Available made to measure in a choice of five timbers! Also available with a matching pair of gates and side access pedestrian gate. 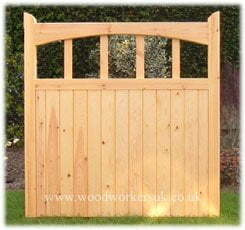 Pictured in Kiln Dried Scandinavian Redwood (Softwood) is our Harlech garden gates. The Harlech feature an elegant ‘underswept’ head which reduces by 3″ / 75mm to the centre. Want it in Hardwood? Or long lasting sustainable Accoya? No problem! 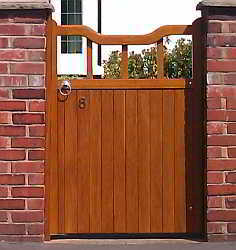 Made to measure the Harlech is also manufactured with matching driveway gates and pedestrian gates. Shown in Prime European Oak, the Bala comprises a shaped, dropped head which falls 3″ / 75mm from it’s starting height. Made to measure and also available in Meranti, Idigbo (both hardwoods), Accoya (Modified Softwood) and Scandinavian Redwood (Softwood). Need a pair of gates to match? The Bala also has matching driveway gates and taller pedestrian gates. Similar to both our Bala and Harlech gates but for those wanting a simpler option is our St Asaph garden gates. Pictured in Prime European Oak and available in a full choice of the timbers we use. 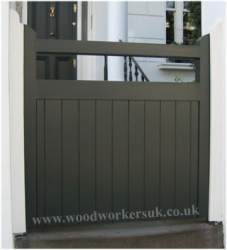 You could also have the matching pair of timber driveway gates and side access gates adorning your house. A variation on the St Asaph garden gates, the Degawny are a less fussy option without the infill in the top open section of the gates. Pictured in painted Softwood and available in all our usual timbers! Even though we do not have matching wooden driveway gates for the Degawny, if you want a pair then get in touch and we’ll make you some! Close boarded Denbigh gate in stunning Idigbo (Hardwood). These are available to you made to measure in European Oak, Meranti and Idigbo (Hardwoods), Accoya (Modified Softwood) and Scandinavian Redwood (Softwood). If required, the Denbigh can also be manufactured without the joggles (horn like protrusions on top corners of each gates) to fit within an enclosed brickwork opening. If you can sketch it we can make it! Looking for something individual or unique, or maybe you are trying to match existing wooden gates and you have your own gate design in mind?If so then please see our bespoke wooden gate page for more information on how to obtain a costing and get a gate manufactured to your own bespoke design.If you are thinking of having a bespoke design, we would, in most cases, require a picture/sketch of the design in order to provide an accurate costing. Each and every gate on this website is made to measure – not near enough but the exact sizes you require. Unsure what sizes you need then get in touch – we’re happy to advise! Heights – Made to measure, generally up to around 4ft 6 high / 1370mm high. For gates taller than this please see our Pedestrian gates page for more options. Accoya (Modified Softwood ) Whats Accoya? Your County or Postcode if delivery is required.